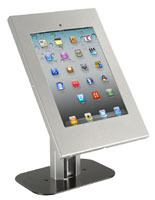 This secure iPad enclosure is designed for bolting to a tabletop or a counter. 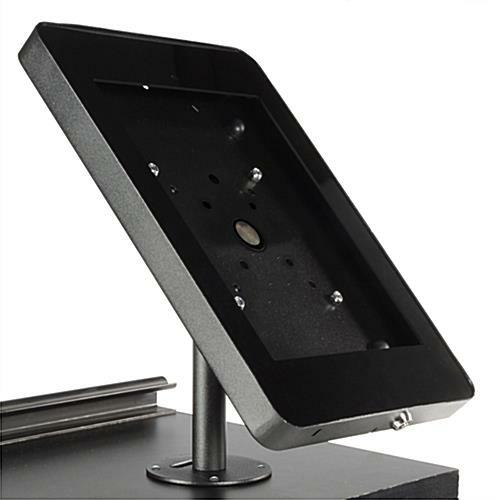 Four predrilled holes are located in the base through which hardware may be inserted to permanently attach the fixture to a counter. 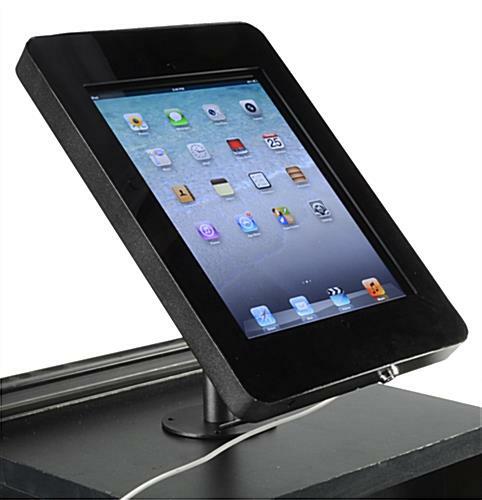 The secure iPad enclosure has a locking design that keeps an electronic device protected while in use. 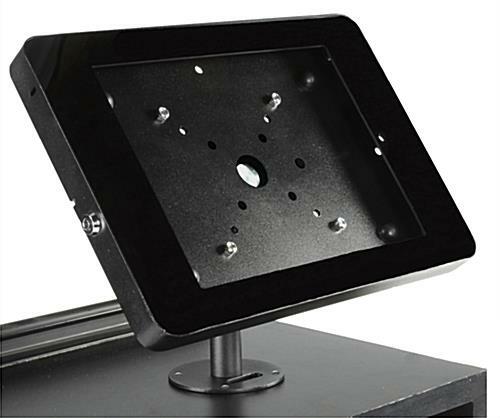 The mount is compatible with Apple generations 2, 3, 4, 5 and Air 1 & 2. While stored within the enclosure, the “Home” button on an electronic device is covered, therefore preventing guests from navigating away from the intended presentation. 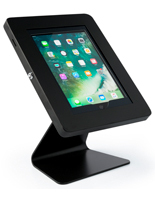 This black iPad enclosure also has a rotating and tilting bracket, thus making it incredibly easy to adjust the angle and orientation of a displayed tablet. I'm really happy with the structure/functionality of these and how they look; unfortunately the lock on one has already broken (it's only been in use for six weeks). I would totally give five stars if it weren't for the broken lock, but since our store is in a high-traffic (high-theft) area, that breakage renders it pretty much useless to me. Hi Lacey! Thank you so much for taking the time to share your feedback with us. 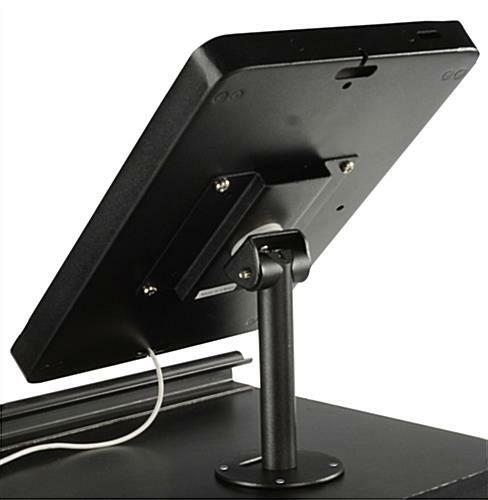 We're glad that you like the look and functionality of these iPad mounts, and we hope they have been a great addition to your store. We understand that security is highly important, especially in high-traffic areas like retail spaces, and we regret that the lock on one unit broke after regular use. We'll certainly send this along to our product development team for review, and a customer care specialist will reach out to you shortly to see how we can best assist. Thank you for bringing this to our attention. Really good solid stand. Holds/fits iPad Air 9.7 really well. Comes with corner squares to fit different sizes. Easy to install and should be very secure. Comes assembled and with hardware, which I love. 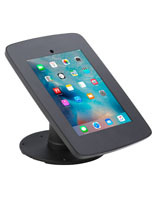 Very sturdy; swivel is tight and secure. Screw or bolt mounting options. Fits iPad perfectly; instructions were easy. Great stuff. 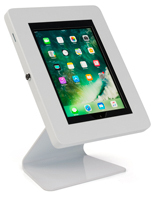 Would heartily recommend this if you're looking for an iPad station somewhere (ours is for a check-in station at church for Children's Ministry). Easy to use/set up. Looks good. I have purchased this item on multiple occasions and will in the future if the need arises. 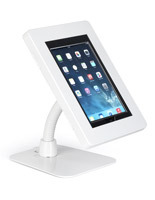 It looks great, and holds various iPads. The only drawback is the amount of space allowed for the charging cable. I recommend getting a 90 degree charging cable to make the fit easier. Other than that, great product.